A 25th wedding anniversary is a big deal and a milestone to celebrate. So if you're looking for ideas for your anniversary celebration, look no further. Here are half a dozen fun ideas, from a classic silver celebration to a 1980s bash and honeymoon-inspired parties. 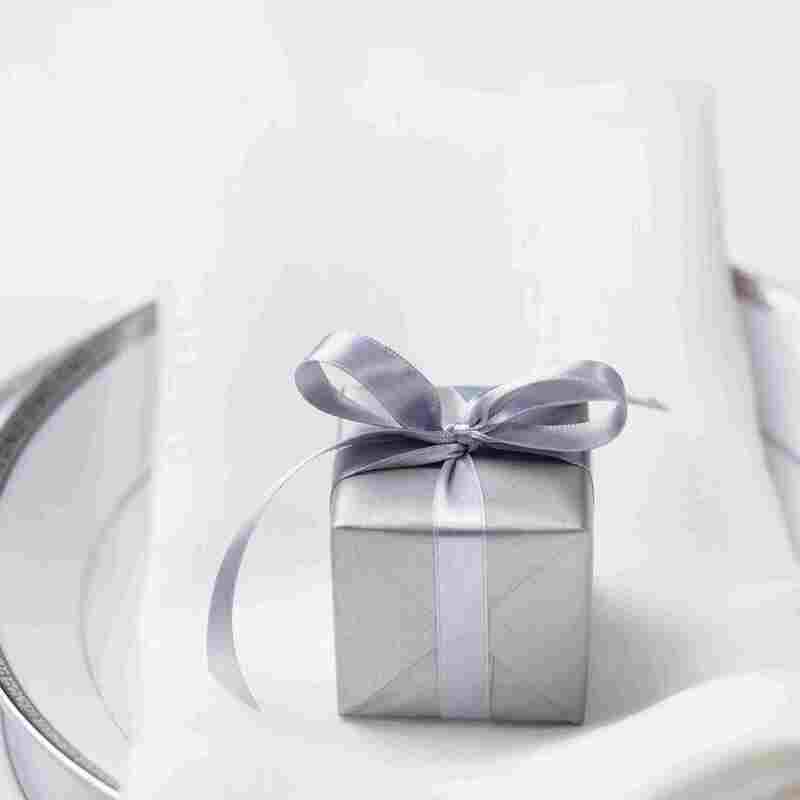 Traditionally, 25th wedding anniversaries are associated with silver. So why not use that hue in elegant, modern, or whimsical ways as the theme for an anniversary party? Cue up the cool jazz soundtrack with a little help from pianist Horace Silver and a playlist of silver-ific songs. Break out the silver-spangled tulle and table settings, especially since they're easy to find at party supply stores. For food, you can serve silver salmon and pick up silver candies or silver-wrapped Hershey's Kisses for guests to munch on. End the meal with a dessert topped with edible silver leaf. A second honeymoon is a lovely way to celebrate a wedding anniversary, especially when it's a big one, like the 25th. But if you want to celebrate with friends and family, whisking everyone off to Greece, Tuscany, or Hawaii is going to be more than a tad pricey. Use that honeymoon destination as inspiration for an anniversary party at home. A Greek feast is a fantastic option. Set it up with blue and white decor, which look fabulous with silver. Create a meze platter of amazing Greek bites, then serve traditional Greek foods like souvlaki and baklava. Don't forget to fill the background with a little sirtaki music and famous Greek musicians to really set the atmosphere. Celebrate with an anniversary party that recalls your dating heyday or your childhood, back in the 1980s. The light-hearted, retro fun of an 80's-theme party evokes those days when hair was big, fashions garish, and the music incredible There's also a good chance you were falling in love or, if you were young, dreaming of your future spouse. So moonwalk with your sweetie, groove to Madonna, and remember that girls (and boys) just want to have fun. This party is mostly about the music and style so just be sure that your guests are aware of the theme so they can dress appropriately! What happens in Vegas, stays in Vegas, right? Well, not if you met there, married there, or honeymooned in the dazzling desert city. Celebrate your big anniversary with a Las Vegas-style anniversary party at home. Plan some casino games, put together an eclectic soundtrack, and even give your party a philanthropic twist if you choose to add gambling to the event. Ah, bella Italia...those days spent in Venice, Tuscany, or Capri were divine on your honeymoon. Now they can inspire your anniversary celebration. Food will be the highlight of the theme and it's the ideal occasion for a rustic Italian dinner party. Serve popular Italian finger foods like calzoni, frittelle, and crostini, then go with a pasta main or explore merry carnival foods. Offer guests Italian favorites like grappa, Cynar, and Prosecco to drink and it will be a party to remember. Hawaiian shirts, grass skirts, coconut bras, and fabulous fruity cocktails. Is there anything more fun than a Hawaiian-style luau? Celebrate your anniversary in tropical style with tiki torches, teriyaki, and ukulele tunes. If you really want to go all out, cook up a kalua pig. Then bring on the hula lessons and queue up the surf music, too!